Join our Ukrainian Cultural Center and Labora staff for an exciting activity-filled evening! Be sure to bring your entire family as there will be activities for everyone to do from learning about something new … to making something new with your very own hands. Our Museum Night promises to be one you will remember for many years to come! Please come 5-10 minutes ahead of your planned excursion. Please note that the number of people per excursion is limited to 30. 18:00 to 23:30 Visitors can print their own handmade postcard on our letterpress in our printing workshop — and then take it home with them! 18:00 to 23:30 Visitors can try out different calligraphy tools in the Tallinn Calligraphy School’s Scriptorium — we’ll have the whole night to create a collective calligraphy art piece in which everyone can take part! 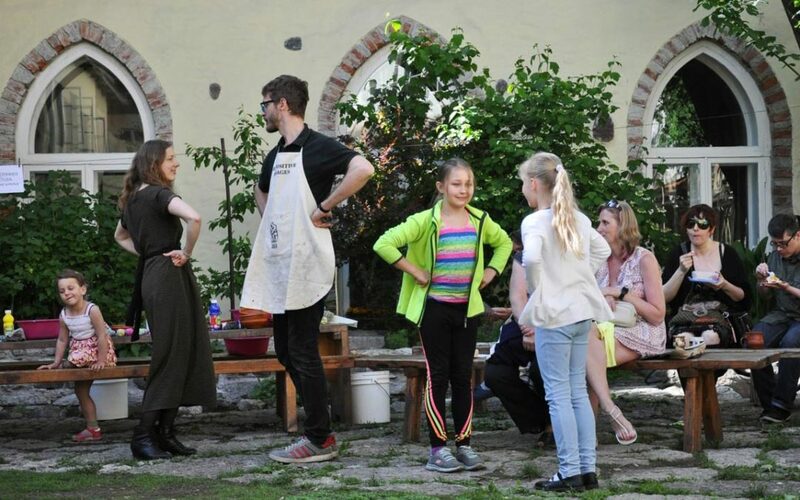 You are also welcome just to step into our courtyard, enjoy our small garden, and try some aromatic herbal tea along with St. Hildegard’s Cookies of Joy prepared using her own recipe!